The Royal Wedding between Prince William & Kate Middleton receives the Queen's Royal approval. 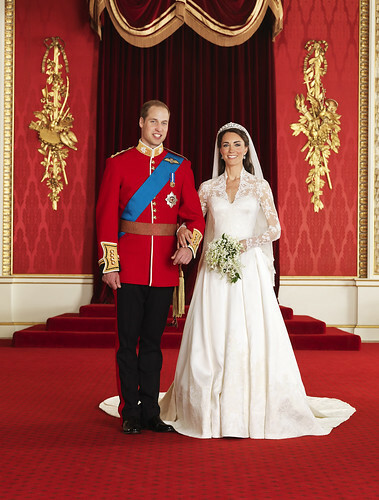 The Queen gave formal consent to Prince William and Kate Middleton’s marriage yesterday. Under the Great Seal of the Realm, The Queen signed a notice of approval which proclaimed, in transcribed calligraphy, consent to the union of "Our Most Dearly Beloved Grandson Prince William Arthur Philip Louis of Wales, K.G. and Our Trusty and Well-beloved Catherine Elizabeth Middleton". Tied to the bottom of the approval by gold braiding is a large red wax Great Seal of the Realm. The law dates back to the 18th Century. Under the Royal Marriages Act 1772, all descendants of King George II must obtain the Sovereign's agreement before they wed. The "Instrument of Consent" features decorative artwork chosen by the artist to represent the groom and bride-to-be. A white lily represents St. Catherine of Siena, whose feast day falls on April 29th and with whom Miss Middleton shares her name. Beneath it is a Welsh leek surrounded by Prince William's white three-pronged second in line to the throne label and a tiny red escallop from the Spencer family Arms. There is also a red dragon - the heraldic symbol of Wales, the UK's floral emblems - the rose, thistle and shamrock - and the Garter belt, Prince William's blue and gold Order of the Garter belt, as well as a large gold E for Elizabeth. The Queen's signature "Elizabeth R" can be seen at the top right of the Instrument of Consent, which is dated "the ninth day of February Two Thousand and Eleven in the Sixtieth year of Our Reign". It was signed "by The Queen herself, signed with her own hand" at a Privy Council meeting after the Monarch made a formal Declaration of Consent. British pomp, ya gotta love it!